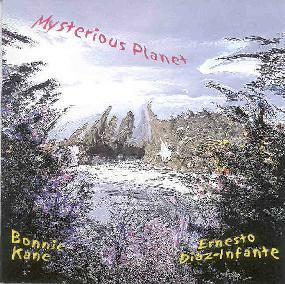 Bonnie Kane & Ernesto Diaz-Infante - "Mysterious Planet"
Here's a treat for those who enjoyed W.O.O. Revelator's team-up with Ernesto Diaz-Infante and the Pat Harmon Duo (see AI #14). A set of duo improvs by W.O.O. member Bonnie Kane on saxophone, flute and electronics and Ernesto on guitar, vocals and tape collage, all recorded from live and radio sessions during August 2000. The album opens with the 34 minute "Stillness Unwinding", a continually evolving collage of sax jams, strange vocal workouts, electronic mayhem, and tape and guitar manipulations. Things get extremely and harshly noisy, more so than typically heard from either of these artists. But once I turned down the volume a bit it became apparent that there's really quite a bit happening at once. I always enjoy Ernesto's guitar scratching techniques that somehow stand out amongst the mayhem. Overall the music is a completely chaotic workout that is best heard if you're feeling really wired. In my case I'd settled into review mode after a very long and aggravating day at work. So I was in the mood for some completely freeform aural assaults produced by artists who take their tumult seriously. The music transitions through a number of themes, the focus being on brain shattering sound sculptures more than anything. The ending is the best part. Bonnie and Ernesto don't wind down near the end of this lengthy jam. Oh, no... the end is one of the most high energy, high volume, space-noise freakouts imaginable. I could feel the blood vessels going off like popcorn in my brain. The rest of the album is similar but "relatively" sedate, featuring more recognizable Bonnie Kane styled saxophone. We get a powerful thrashing rhythmic base by guest Andre Custodio on drums on "The Canyon Bottom". Ernesto kicks out some killer avant-acid mindfuck guitar on "Underlying Nature", the same track also exploring the marriage of Blues with space-noise. Overall, a very intense hour of listening that requires seatbelts and a rollbar. Not the place to start for newcomers to Bonnie and Ernesto's music but lots of interesting sounds and ideas to be heard by veteran fans. Visit the Pax Records web site at: http://www.paxrecordings.com.